When a book hits you so hard that you ache turning every page and feel the pain the characters do, you know the author has done a brilliant job. Krissy V has once again astounded me. My One Regret is simply magnificent. The story of Cassie - a 16 year old high school student from Newquay in Cornwall. A good friend, daughter and student. But meeting David, a friends cousin from Bristol would change Cassie's life forever. I can feel the fight leaving leaving me and I am finally ready to accept whatever fate has in store for me. The mentality of the perpetrator was chilling and so well portrayed. I hated him with every ounce of worth. Babe, I'm going to finish what I started tonight. You won't know when, but you WILL see me again. Cassie's best friend, would be by her side. Listen and simply be there for her. But upon the next meet with the offender, David she would insist on things going further. For Cassie's own peace of mind if nothing else. The pair had a bond that was unbreakable. It's at this moment that I decide that I will protest Cassie and keep her away from guys. She doesn't need them in her life right now. When the torment of David taking advantage of Cassie again, she finds herself seeking escape. In any which way. Much to the utter devastation of all her friends and family. But with a love interest striking up with Jordan, the future keeps the pair apart a little longer while they both settle themselves into careers. Time would pass before they come back into one another's lives. But fear that both of them may have moved on would play on both their minds. Would the same feelings still be there? I know everyone says you never forget your first love and I can honestly say that it's true...I don't regret anything about my life ...Jordan is my one regret in life. But Cassie's heartbreak would not be over, as she loses another vital piece of her heart. And her return home would lead her, not only to her first love, but also a threat from her past. One she very much wanted to forget. I lay there and hope that what happened with David won't affect my feelings for Jordan...all I want to do is to go through one day without something triggering a memory and then I want to wake up one day and believe that it never happened. As Cassie comes to term with massive life changing events, her friends, family and Jordan all support her. No matter how far she pushes them away. No regrets remember. We are the people we are today because of that time we spent apart. We never really let each other go, our hearts were always searching for each other and we were never far from each other's minds. I don't want to say too much more...other than please buy this book. It breaks your heart, then slowly pieces it back together. A beautiful journey of surviving, healing and rebuilding after some of the most traumatic moments one person can handle. I can't praise this book enough, only to say that it will forever remain in my heart and Krissy V has once again blown me away. 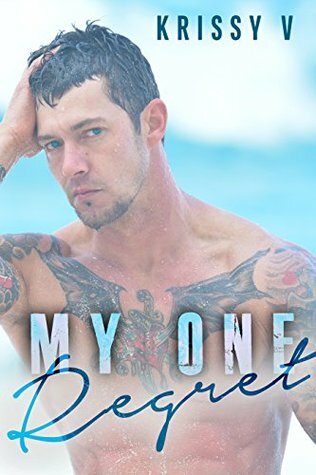 Get your copy of My One Regret here (UK) or here (US). Add to your Goodreads TBR here.